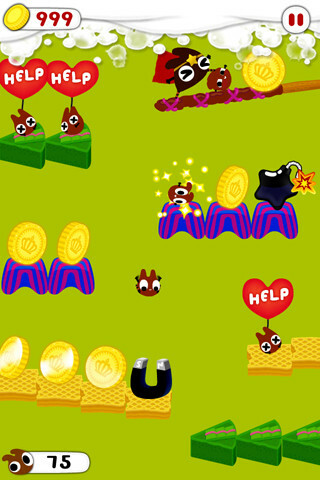 Chocohero is one of the more rather bizarre games available for the iPhone, iPad, and iPod Touch. 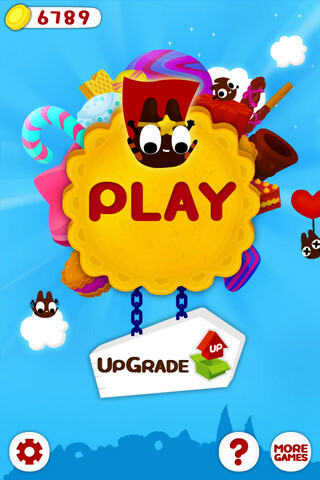 This iPhone app has users take control of Chipster, the hero of the game , as they try to help him rescue all of his equally bizarre friends throughout the tasty world of Smoresdom. This application includes all types of power up type items in the form of treats and chocolate, as Chipster will need all the help he can get in order to take down the ominous Cakems, who are holding his delectable friends prisoner. The premise of the game has Chipster running, or falling rather, as the user must tilt the screen to the right of left to direct him. The objective is to attack the Cakems who are out to get you and your friends, while simultaneously freeing your friends. The application provides you with a set of objectives before each level begins while letting you know how many friends you need to free to advance. For the more rigorous gamer, you can choose to collect all of the items and power ups in each level before advancing to the next one, including magnets and clocks. Once you collect a certain number of power ups, an even crazier “Fever Mode”, an extremely hectic experience with bright flashing colors taking over the screen as the already fast paced action speeds up even more. The graphics, while obviously simply done, are rather compelling, fun and cute. The ultimate goal is to complete each objective, with each successful completion adding to the hero Chipster’s cape. The longer Chipster’s cape grows, the more powerful he becomes. The controls are simple enough for players of all ages to grasp, yet the app is addicting enough to hold the attention of player’s of any age. For 99 cents, Chocohero is truly one of the biggest bargains in the cyber world for iPhone, iPad , and iPod Touch owners. The concept of Chipster, the Chocohero, Smoresdom, the Cakems, and most importantly, Fever Mode, is both brilliant and addictive. The app is truly a simple one and the action is often hectic and fast paced. Players used to buttons and control sticks may have a slightly difficult time adjusting to the tilt concept of controlling Chipster, especially in such a fast paced world. While not exactly the most detailed graphics in the world, they do not try to be that. The graphics for Chocohero are certainly fun and add to the experience. At 99 cents, Chocohero is one of the more valuable games on the market and worth every penny. Do yourself a favor and download this iPhone app as soon as possible. Once you get started, it is nearly impossible to put it down. Even after you beat all the objectives, there’s always more items and power ups to go back and collect. Chipster and his Smoresdom friends need your help! AppSafari review of Chocohero was written by Joe Seifi on November 21st, 2011 and categorized under Action, App Store, Arcade, Featured, Fun, Games, Physics Based. Page viewed 8586 times, 8 so far today. Need help on using these apps? Please read the Help Page. It is the most bizarre game I’ve seen so far, it is so bizarre that actually, it’s really nice and fun. I found the game really bizarre as mentioned in the article, but at the same time it is very good! This app looks like fun!